So now that we know about the precautionary procedure, what happens if we have NO engine power? We plan a forced landing! The image above shows an actual forced landing of a Boeing 737 jet. TACA Airlines Flight 110 lost power in both engines and successfully glided and landed on an unprepared, makeshift field (image courtesy of airliners.net). Is planning a forced landing possible? 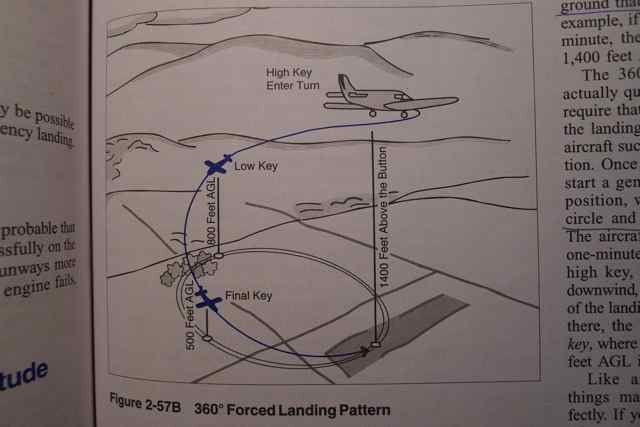 For those who believe that a successful forced landing is difficult or impossible to achieve, Transport Canada’s “Flight Training Manual” (FTM) reminds us that for glider pilots every landing must be a successful forced landing. Hence, it is not only possible that it can be done, it can be done well. Yesterday I went through the basics again with my instructor. Each instructor has a different way of teaching, so the method will vary slightly for everyone. The basics are more or less the same. 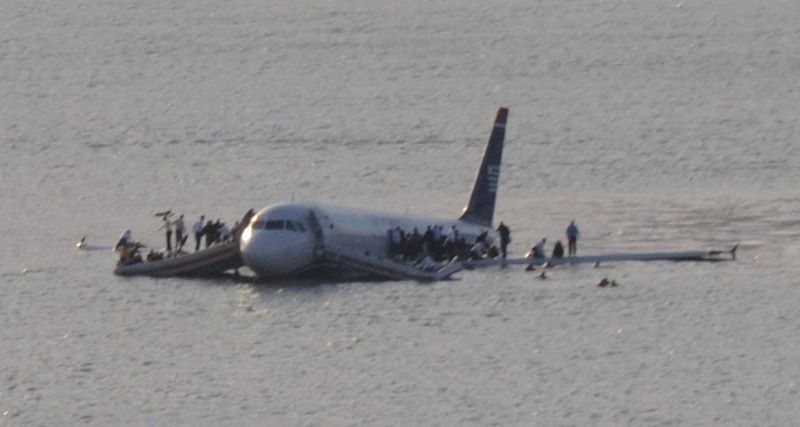 Famous Forced Landing: The ditching of US Airways Flight 1549 into the Hudson River. Image Courtesy of wikipedia.org. The most successful recent emergency forced landing was US Airways flight 1549: a ditching in the Hudson River. After multiple bird strikes into the engines caused dual engine flameout, the gliding Airbus A320, which didn’t have enough altitude to return to the airport, was successfully ditched in the Hudson River. 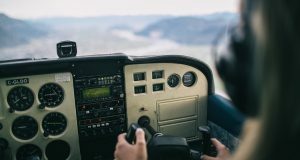 Like all pilots, trained in forced approaches, he captain used the same line of thinking that we are taught when learning how to execute a forced approach and landing. 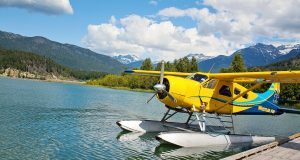 We are flying along – and – we’ve lost engine power! What is the first thing we do? We fly the plane. We have to establish our aircraft in “best glide speed.” For the Cessna 172, this is 65 knots. 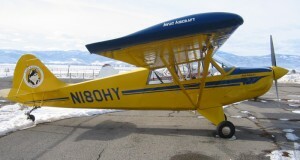 The best glide speed provides the maximum “lift to drag” ratio and allows the airplane to glide as as long as possible. 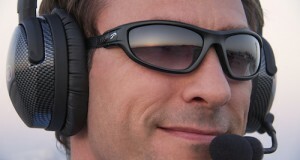 Now we have to look outside and quickly locate the best field where we will put our aircraft. We locate this field, and turn towards it. Look for indicators of wind direction on the ground, and make your best efforts to land into the wind. If in doubt of wind direction, simply plan to land in the same direction that you took off from the airport. Make sure to do a good check of the suitability of the area for landing. This means: check for civilization, obstacles, wind, field length, and landing surface – abbreviated the COWLS check. Now that we have our field chosen and have established our glide, we have some time to do some quick engine checks to try to determine the cause of engine failure. Often, with carburetor equipped aircraft such as the Cessna 172 the engine can die due to carb icing. Or if we descend from a higher altitude and we fail to richen the mixture. These quit simple steps will attempt to reestablish engine power and will not cause us to loose too much time and altitude. The above three steps should take us about 500′ of elevation loss to do. Since this is a simulation … we do an engine warm up by adding 200 or so RPM. Before we get too low we make the Mayday call. We say “Mayday” three times and our aircraft identifier three times (just like in the case of a precautionary landing). Broadcast your location, your intentions of where you plan to put the aircraft, the nature of your emergency, and the number of people aboard. Let your passengers know: to put their seat back, stay clear of flight controls, put away all sharp objects, and so on. You can let them know where the ELT and fire extinguisher are. Also, it is important to ask them to unlatch the door prior to touchdown. 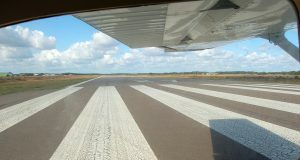 If this landing is on an unprepared surface, your landing will be a soft field landing. 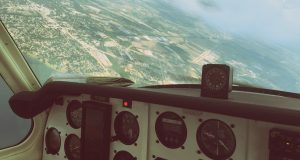 Make sure to assess how the prevailing winds will affect your approach and landing. What are the upper winds doing? Also state that you intend to touch down on the first third of the field. 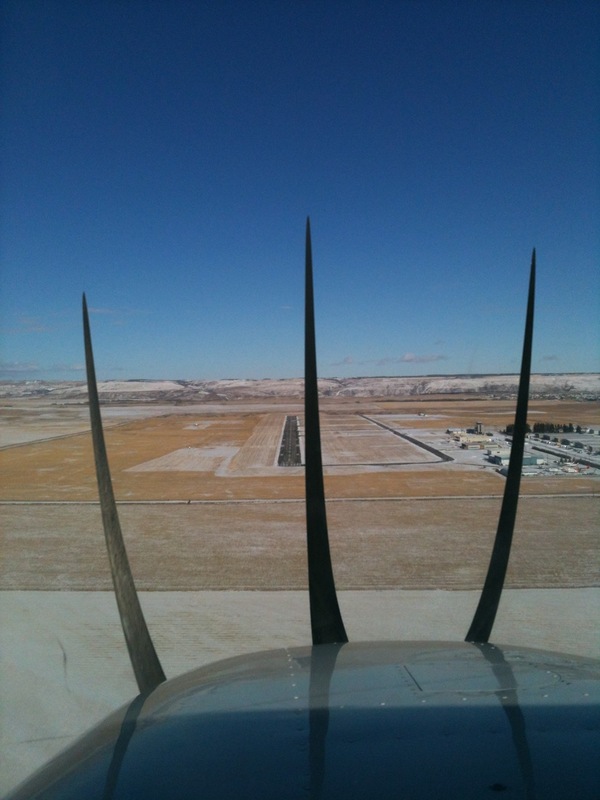 For the Cessna 172, we touch down slightly tail low and turn off the electrical as instructed in the POH. 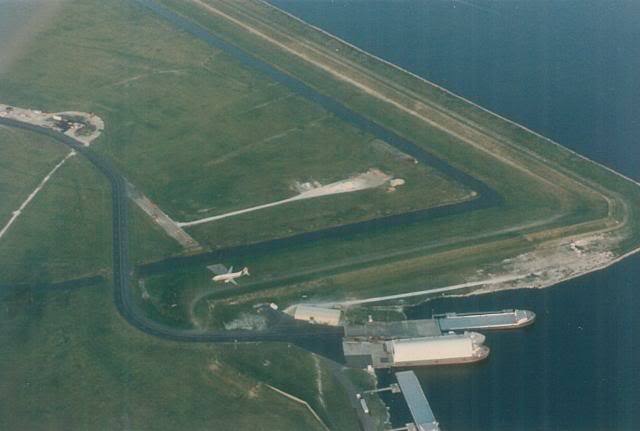 Another example of a very successful forced approach is in the case of Taca Airlines Flight 110 on May 24, 1988. After flying through severe thunderstorms, the jet lost both engines that the pilots were not able to restart. 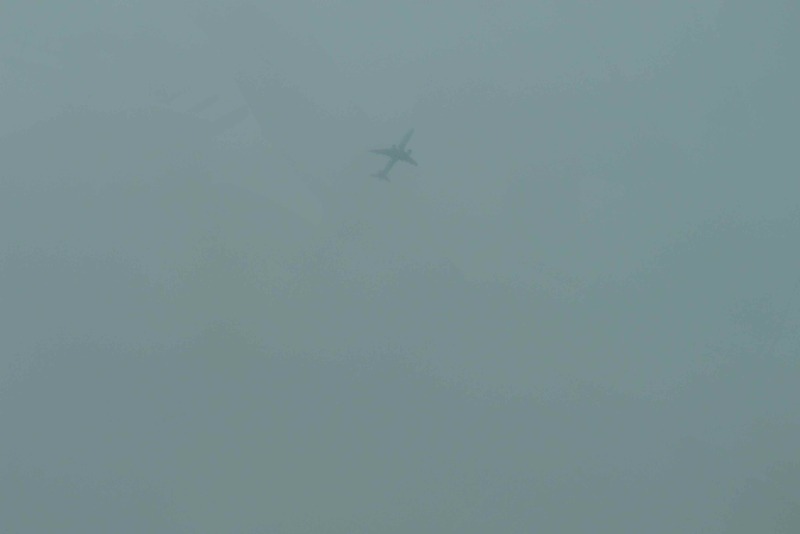 In the perfect moment the captain found a grass field and pointed the giant gliding 737 towards it. He was able to land successfully with no loss of life and minimal aircraft damage. In fact, Boeing engineers were able to do the necessary repair work on the spot and the aircraft was flown from the very spot where it was landed! Watch the video of the incident below. 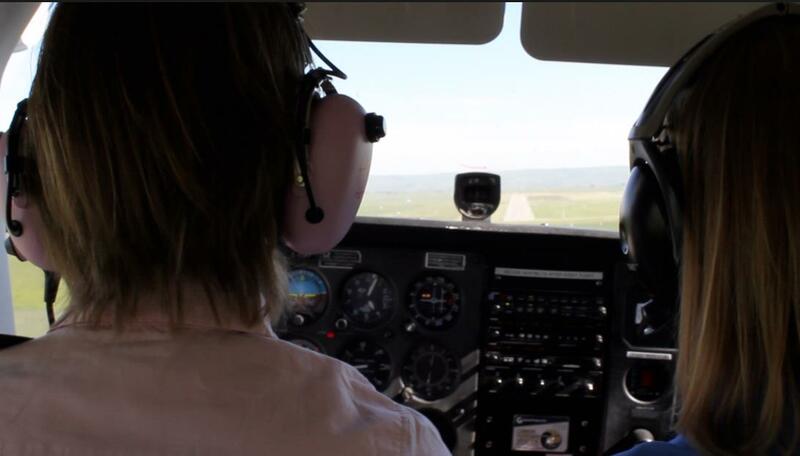 Read details of how to plan your approach and land in your desired touchdown spot. This is the low key / high key planning procedure. Sorry, I’ve been slow on this one. Almost two months! Thanks for your patience … working on it right now. Great post! And a great reminder to always practice forced approaches. Hi Jordan, thanks for the comment! The Cessna 172s we fly are late 1970’s models, and all have carburetors. Perhaps some of the newer 172s are fuel injected?